In the National Sub-Junior Aquatic Championship 2010 held at Basavangudi Aquatic Center, Bangalore during 12th July to 15th July 2010 swimmers from Belgaum represented Karnataka outperformed. 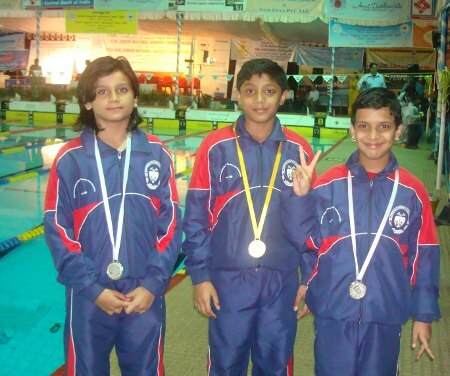 Belgaum swimmers brought 1 Gold, 5 Silver Medals in the tough competetion. Nearly 1000 swimmers from all over India took part in this championship. The swimmers are members of Swimmer’s Club Belgaum & Aquarius Swim Club Belgaum and practicing at Rotary Corporation Swimming Pool, Goaves, Belgaum. The swimmers are being coached under the watchful guidance of Akshay Sheregar, Ajinkya Mendke, Prasad Tangankar and Lakhan Shahapurkar. Hi kiddos, you all are pride of Belgaum. Good job! Keep it up, dream big and put Belgaum on the world map in sports.